We're mid-way into the 1st month of Spring. The weather has not really warmed up. We've had a few days of warmish weather around early 20s. It's time to change the clothes in the wardrobe - out with the woolen jumpers and jackets and in with the lighter wear - dresses, skirts etc. Caitlin is very excited that Spring is here. It means she can now wear dresses and sandals. Since Caitlin has outgrown her pair of sandals from last year, we had to buy her a new pair. We found this new style at the Crocs store in Chatswood. We did not find a suitable pair for Ashleigh at the Crocs store. Will have to check out another shoe store - The Shoe Shop @ Northbridge. Ashleigh has narrow feet, it's a challenge to find the right pair of sandals for her. The violets from yoiur garden are so petite and lovely. And Caitlin's new pair of croc shoes, I love the bold colours! 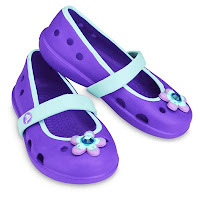 i sure hope crocs has this in adult sizes....love it!!! mid way of spring in september?? How lucky. it is fall in toronto for us lah.. its getting so cold and ugly weather. Tania: Those crocs only came in children's sizes. Maybe there might be more choices in US.